In the new era, there was created a new culture of writing in online. We don’t use full words now and we are obsessed with emoticons. Even if you write a text, or post on Facebook or have a conversation on WhatsApp emoticons is something you need. So if you laugh there is a lol there or a smiling face, if you are sad there is sad face or a face with teaers. There are times when you can put emoticons like animals. But what are these emojis? Emoji is part of Japanese culture. “E” stands for picture and “moji” meaning letter. If you have Android 4.4 KitKat on your phone, you have this emojis on board. But what happens when you don’t have Android 4.4? Well, it is simple. You can download the .apk file for the keyboard. Be very careful about third party apps that you install, that they won’t hurt your software. All done ! 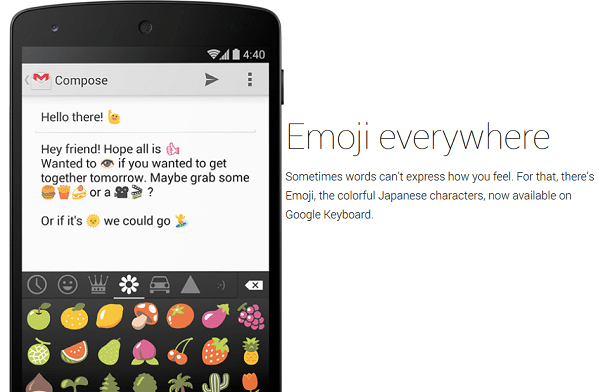 From now on you can put emojis on your text messages or on your online apps.